Le sigh…another Fashion Week has come and gone. I didn’t get invited nor did I walk in any shows. I suppose I would have to be a model or a designer or a reporter to do these things, but I’m not, yet. I love fashion. I love the hype and the illusion. I love the art and the eccentricity. I love the runways and the hair. I just adore it. I really must get into this world somehow. I need abs. Being skinny just doesn’t cut it anymore. I remember back in the early 2000s, the waif male model was the look. That was so much easier than the fit musculature they look for now. I have abs…they’re just under a bit of flab. I’m not fat but it won’t go away. I’ve gone running, walked for days, did yoga till I could massage my back with my knees, and still nothing. I look exactly the same. Not sure what I’m doing wrong. It’s probably the chocolate. I love me some chocolate. Anyway, even though Fashion Week is over, it can still live on forever in our hearts. 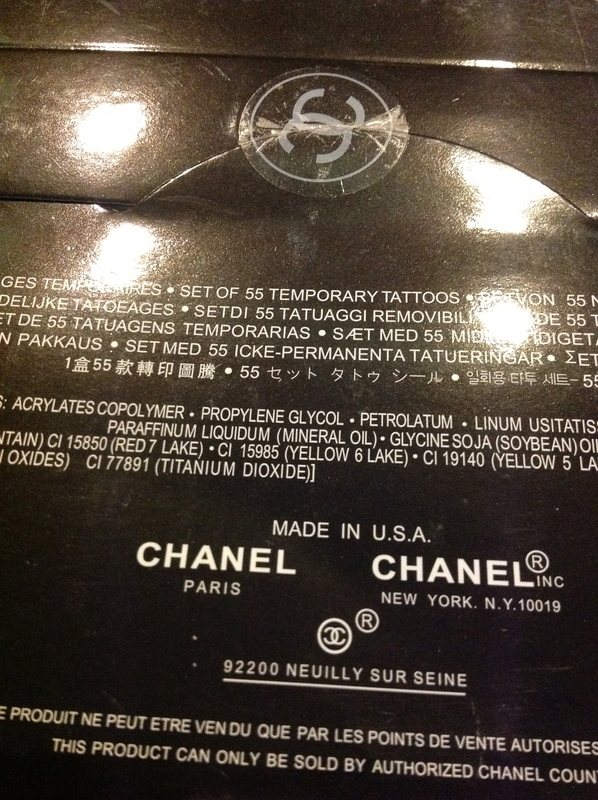 I am continuing the eleganza by wearing Chanel tattoos. I told you about them when I wrote my blog post about my Hermès cord collector. Well, they finally arrived! I’ll tell you all about them, but we need some fashion-esque music. Here’s an album I’ve been model walking to for a couple weeks now. I love it. I was so freaking excited when I opened the mailbox and my tattoos had arrived! I was also excited because I paid $12, not $78 as they originally cost. Can you imagine? God, I love Karl. This isn’t my picture, I found it online. My envelope is a bit scuffed up. But, this looks almost exactly like my desk, so it works. Reverently, I broke the Chanel seal on the back. It was quite an experience for me. I’m obsessed with Chanel. I don’t own anything by Chanel, they should really make clothing for men. 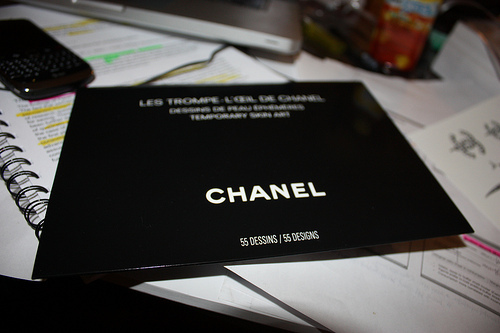 If I could get myself into a Chanel suit, I’d fall into a pile of goo. Wouldn’t it be wonderful? 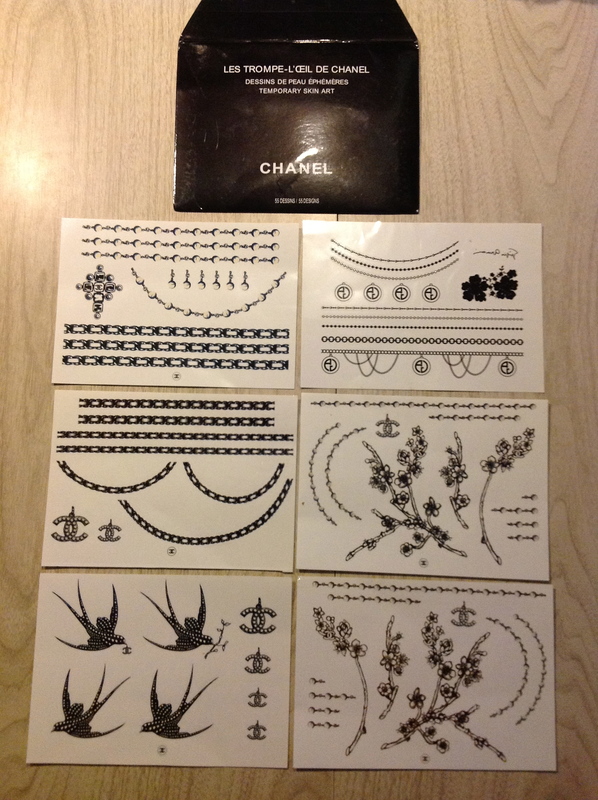 So, I will have to settle for these gorgeous tattoos and a spritz of Chanel No. 5 when I go into the department stores. I didn’t know what to do first! Many of the tattoos are rather feminine, which I don’t mind, but I wanted something bold. I studied the designs and then browsed what other people had done. Nice, nice, but I didn’t want anything on my legs. They’re far too hairy for temporary tattoos. Now, this I liked, the one on her clavicle. I looked around my designs and picked out what I thought would look good. Two birds and a chain. Nervously, I stood in front of the mirror and carefully applied them to my chest where I thought would look good. My heart beat rapidly as I wet the tattoos. (This sounds overly dramatic, doesn’t it? I was just so excited!) The tattoo came off perfectly. I smiled happily as I applied the first bird. It was a bit tricky because I wanted to apply the beak perfectly on the chain so it looked as if it were carrying it. I did a fairly good job, I think, and I’m very happy with the results. I think it turned out rather nicely. I’m happy with it anyway. Plus, it gave me the opportunity to pose, which always makes me happy. My face was cut off in this one, but I like the way my arms look, so, whatevs. 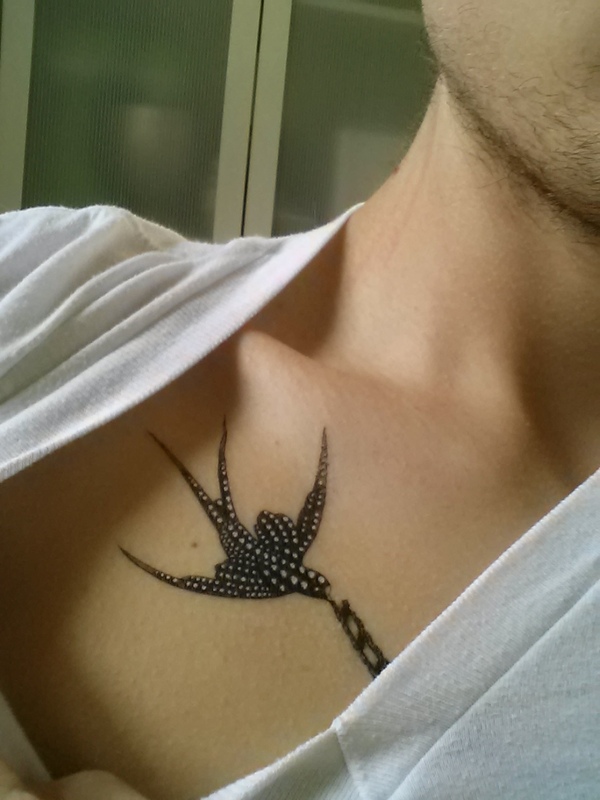 And now, whenever I see a peek of my tattoo, I feel that Karl is near me. I’ll be a model. I will.